Internet Marketing is the necessity for any business to ensure they stay in the market and lead the competition. 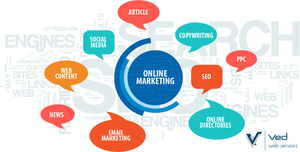 Our digital marketing services help you to highlight your space in digital World. We at Ved Web Services offers you all the online marketing services like SEO, SMM, SEM, PPC, link building with affordable price. We also offer On Page Optimization, Linking Building, Content Marketing, Penalties and Reconsideration, Pay Pre Click, Search Marketing. We provide the complete set of Web Design and Internet Marketing Services in India, helps in accomplish greater results through digital marketing techniques such as Google Adwords, Email Marketing and Affiliate Marketing. Ved Web Services is a leading Internet Marketing and SEO service provider Company in India, specializing in the digital marketing services, web design & development. For more information visit website : httpwww.vedwebservices.com/services/internet-marketing/ or Call at : +91-079-40094441.